Agents Blitzwing01 and SovietAirman reporting in with some juicy details from Anime North 2005! This convention had the privilege of being graced with the presence of voice actress Sanada Asami, and we were there to get the scoop at the Saturday evening Q&A. Best known for her role as Dejiko from Di Gi Charat, Sanada-san has played several other parts, including Sakurada Jun from Rozen Maiden, Oe Chizuko from Mahoromatic, and Tamai Shiina from Narutaru. She is also an established idol, having performed the theme songs for much of the Di Gi Charat franchise as well as the ending themes for both seasons of Mahoromatic as a member of the group Triomatic. 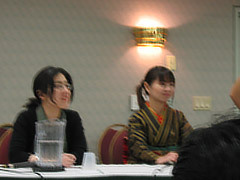 Dressed in a kimono and flanked by her translator and con staff, she answered about an hour's worth of questions for the audience. Throughout the session, she was very enthusiastic and even gave her English a shot a few times! The attendees were lively and involved, and everything proceeded smoothly.